Rosie Danvers has been back in the studio with Singer / Songwriter Andrew Watt and 5 SECONDS OF SUMMER to record a brilliant new track for their forthcoming album. Having worked with Andrew Watt previously on tracks for Rita Ora’s forthcoming album, it was brilliant to be back in the studio working on a new and exciting track with Andrew. Strings Arranged by Rosie Danvers and Performed by Wired Strings. Strings Produced by TommyD, Engineered by Nick Taylor and Recorded at Air Edel, London. 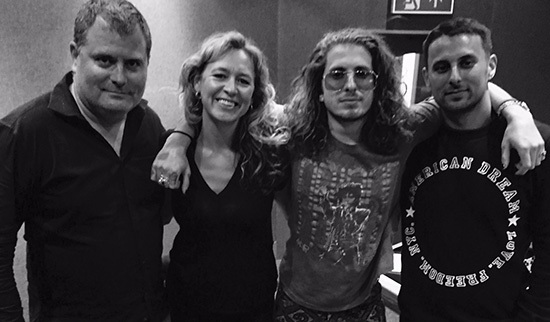 Photo from left to right: TommyD, Rosie Danvers, Andrew Watt and Ben Evans at Air Edel, London.